Funny. Isn’t it?. Yeah. 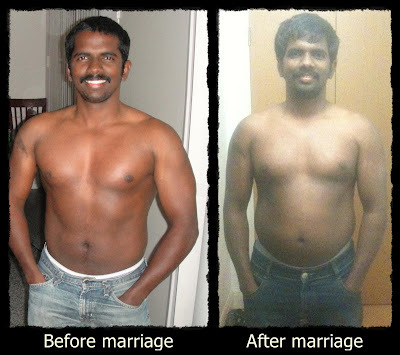 “Before & After marriage” is just for fun. The idea is the transformation of my body within a few months after coming to the UK. The first picture was taken on June 2, 2011, in Los Angeles and the second one on Aug 22, 2012, in London. I did not go to the gym from July 2011 onward, my food habits did not change very much and I retained the same body structure until mid-2012. I am officially into the Overweight category as of August 22, 2012. I believe, I was in this category for quite some time and I did not realize it. Weighing 80 kg at 5 feet 6 inches in my 29th year, pushed my BMI to 28.34. Within a few months, I may move into the Obese category if I do not act now. My body transformation is due to the same old reasons. Sedentary lifestyle and consumption of excessive calories. What was changed in my diet?. hmm… Muffins… Muffins… Muaaahhh… Yeah, I begin to eat muffins every day, after coming to the UK… Thanks to my wife. (She eats as much as I do and surprisingly she remains slim). I would say, “A muffin a day, keeps your six packs away”. For me to get back to old shape is pretty easy. I am very much used to controlling the diet and regular workouts. I can get back to that shape in 3 months time. (Any one willing to bet a million pounds on this?). But, I am not going to do that. When I was in perfect shape, I use to advise my overweight/obese friends on diets and workouts. Few attempted, but none of them followed through. What was holding them?. I think I know a little bit now. We don’t consider our body as a gift, but excess luggage. We begin to detach ourselves from our body and in extreme cases, we hate our body. Our mind prefers to do other seemingly important tasks than paying attention to the body needs. With this mindset, it’s extremely difficult for overweight/obese people to hit the gym every day. That’s fair. Yeah. The point is… Building the perfect physique is not that tough and hard. I use to hear a lot of simple techniques to lose weight from my friends, relatives, internet etc… I never attempted to try any of them other than the tough workouts. This time, it’s going to be different. I am going to choose a few of these tips and try them one at a time. The filtering criteria are, It should be simple and should not demand a drastic change in lifestyle. However, I see those simple changes as simple lifestyle changes. Eventually, our lifestyle and habit change to a certain point that being overweight/obese is something that you cannot even think of or you would laugh at it. Yeah. that’s the goal. What are all the tips that I am going to try?. I do not know at this point. I am gonna research and use my body as a guinea pig for all those experiments. I don’t want to walk this journey alone. I prefer company. If you are overweight/obese or just want to shed a few pounds off or just to keep yourself fit, you can follow me on this journey. I will try to blog as much as I can about the experiments and post the results as well. This is not a Six-Packs-In-Six-Weeks program. This is a slow journey. I cannot guarantee your results. It depends on the individuals. You may see results or may not. You are responsible for all your actions. Please check with your doctor, before attempting any of the experiments that I am going to blog about. PS: All the tips that I blogged years ago does not make sense now. I removed those blog posts. Sorry, if I gave you false hopes.